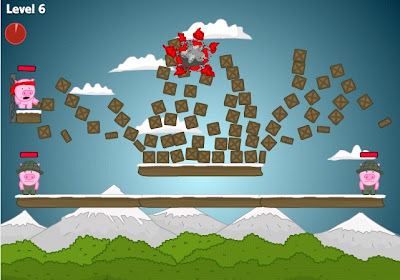 Hambo is another new addicting funny physics based aim and shoot game from notdoppler. Play as a little piglet commando whose mission is to rescue a friend, Bacon. Use a variety of weapons and skillfully take any hostiles down through 36 challenging levels. As you progress in the game, you will be challenged by more difficult levels mostly with a challenging scenario i.e. limited ammo or targets that requires precision and epicness. Anyways, should you find yourself in a situation far from good, consider this Hambo walkthrough (shows all levels w/ all gold) your back up.